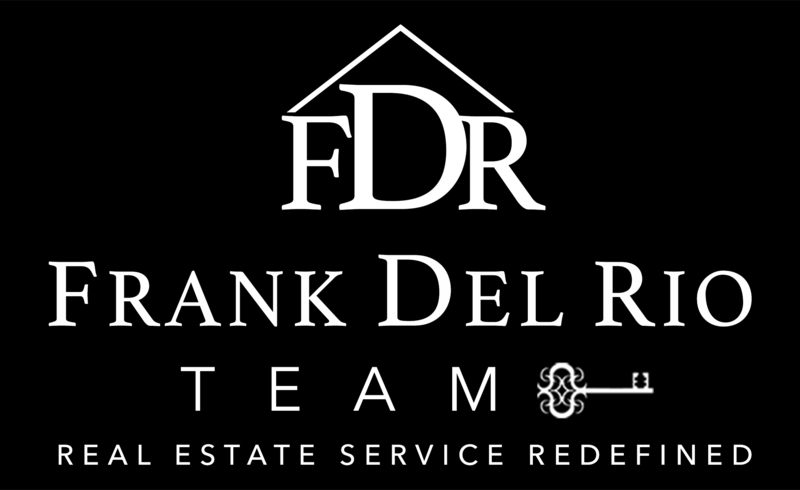 Frank Del Rio has been a full-time successful real estate professional since 1999. He has sold over $100 Million in residential real estate in his career, and he has experience in all types of markets for well over a decade now. Because of his marketing and negotiating skills that he has acquired over the years as a Realtor, and by being a certified expert in understanding the local marketplace, he continues to be a top producing agent in the Los Angeles and North Orange Counties. Educating his clients is one of the essential steps he takes for a successful real estate transaction. Frank addresses potential problems before they appear, and he keeps his buyers and sellers informed throughout the entire transaction. Frank's mission is to cultivate lifelong relationships with clients and their families by providing industry leading information, cutting edge technology, and personalized service. Contact Frank Del Rio and you'll see for yourself why Frank is known for getting the job done! 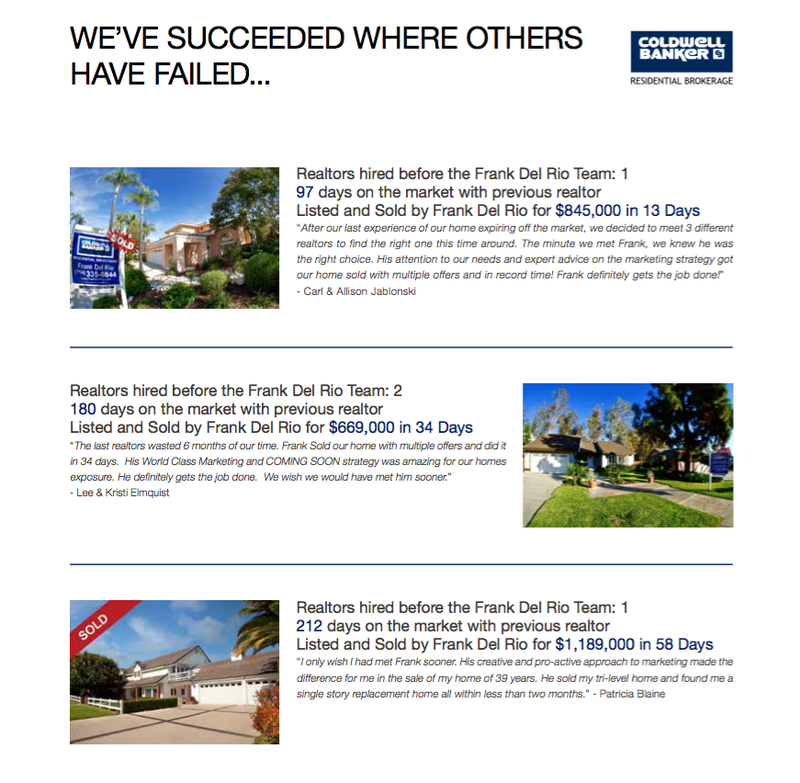 Frank’s clients have been hiring him for well over a decade to sell some of the most prized properties that they own. His focus is to always set the bar higher with setting record prices for his clients homes and he does that with beautiful marketing that tells a story. Because of this approach, Frank sells his listings in 39 days on average and for 10% more money than the average real estate agent. Home-sellers feel comfortable and confident that Frank will sell their home quickly and for top dollar. Frank Del Rio consistently sells homes in high volume year after year. Through his perpetual repetition of sales he has mastered the skills of marketing, leveraging and negotiating to help you feel comfortable and to achieve the best terms and highest possible sales price. 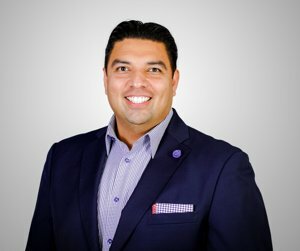 Frank’s approach to getting your home sold is unique, as he is backed by a full-service Client Care Team which enables him to spend all his time actively reaching out to everyone who could possibly want to buy your home. His team of professionals flawlessly take care of all the details of your transaction, leaving Frank to negotiate you the best price and terms on the sale of your home. Frank uses every tool available and looks globally for inspiration because he wants to make sure his clients homes are famous not only in the neighborhood but around the world. He approaches marketing from a completely different perspective creating a theme around his clients homes and create a marketing plan for how to find the most probable buyer for that property, it's the concept of micro branding but so powerful that when you see a home it's not just an address, bedrooms bathrooms, and square footage, it's a story that you can get wrapped up in like a good book or a great movie. It's to help make that buyer see themselves in the home. This buzz created by Frank & his team is not just about marketing and advertising it's about selling homes for more money and in a shorter amount of time. Frank knows his clients have spent years investing in their home and out of respect he brings the same level of dedication and energy to his marketing. Bought a Single Family home in 2017 for approximately $750K in Tustin, CA. Frank and his entire team was very responsive to my many text messages and was always communicative with the process and where we were every step of the way. He took time out of his precious weekends, often Sundays and even Super Bowl Sunday to speak to my husband and I in regards to potential offers for homes. Thank you Frank, Alex and everyone on your team for making our first home purchase a wonderful experience! Sold a Condo home in 2017 for approximately $450K in Azusa, CA. Frank recently sold our home on Oakview Drive in Azusa. He is extremely knowledgeable and patient! He took the time to walk us through the entire selling process and was open and honest with us about all the possibilities this process might bring. Frank sent over a professional cleaning team and a professional photographer before he held an Open House. Once we did hold the Open House, we had multiple offers in the next few days and opened Escrow within a week. From then on, he made the process so easy for us. His entire team - especially Diana Vuong, was professional, courteous, and went above and beyond to answer our questions and generally to calm our nerves during the very stressful time of packing and selling a house! I trust Frank completely and would highly recommend him to others. I look forward to working with him to find a new home! Sold a Single Family home in 2017 for approximately $675K in Upland, CA. Frank and his team are amazing! They kept us updated throughout the process, and helped us navigate through the paperwork. Frank was the listing agent on this home 12 years ago when we purchased it, and he stayed in contact with us over the years. When it was time for us to move, we knew Frank would be our listing agent. Frank's awesome pre-marketing program helped us sell our home for over asking AND before we went live on the market! If you want results, call Frank and his team! Sold a Single Family home in 2016 for approximately $525K in Whittier, CA. Couldn't ask for a better person to help us sell our home. Frank is THE best! He works hard, always responsive and was extremely patient and understanding of our unique situation. A good friend of mine recommended Frank Del Rio and after our first meeting, I felt good about our decision to sell and we instantly formed a connection with him. He delivered what he committed to and he went well above and beyond our expectations. If you want your house sold, he's the man to do it! Sold a Condo home in 2016 for approximately $350K in Chino, CA. Hands down, Frank is an excellent real estate agent! From assessing the value of the house, signing the listing agreement, generating the right traffic of buyers to finally closing the sale of the property, Frank and his team got it down to a science, with excellent customer service combined with great awareness of how sensitive and emotional this whole process could be. Bought a Single Family home in 2017 for approximately $1.05M in Brea, CA. Frank's experience and professionalism made the process seem seamless from offer to closing. Even if the unexpected occurred, Frank's reassurance help put our minds at ease. Thank you!